Last week was really hard. I feel like I watched the biggest public spectacle of gender politics in my life. Women bared their hearts and souls, bravely gathered enough courage to share horrific stories of abuse, marginalization and assault, and the men in power turned their heads. Not only did they look away, but they dismissed the pain as meaningless, they dismissed the stories as not important, and then turned themselves into the ‘real’ victims. Then we watched our own, those among us who should be the ones standing up for us, vote with the patriarchy. They voted with the ones who keep us marginalized, who abuse us, who mock and ridicule us for being ‘hysterical,’ or ‘childish,’ or liars. My fury from the previous week has morphed into rage, and not only rage against those in power that allow my gender to feel so powerless, but rage against the 53%. Fifty-three percent of white women helped to elect our current administration, 53% voted against a woman who would have shattered the glass ceiling. These women voted in a way that ‘put their racial privilege ahead of their second-class gender status in 2016 by voting to uphold a system that values only their whiteness, just as they have for decades.’ New York Times Op-Ed. This same demographic betrayed us last week. What is going on, why is this happening, and what can we do to change it? White women. I am one, and I am appalled that we are even having a discussion about how to get my gender to care about one another. I genuinely don’t understand how there is a subset of women of any race that could think differently on this, especially when it comes to our rights, our bodies, and the potential futures of our daughters. I am angered and frustrated by the lack of ‘sisterhood’ that seems to be present in our current society. I wonder why we aren’t looking out for one another more. However, when I think about it, I realize that when women are discriminated against, our competition with one another as well as our consistent back-stabbing and betrayal of one another is allowed to proliferate. I also think about my own history, and I see how I have allowed these competitive feelings to shape how I feel about other women. I have had many instances where differences or rivalries have overridden friendship. As long as I can recall, I have been competing against other women. In high school I remember vying for the top spot in my graduating class. There were five other girls also competing for that same position. We were ruthless and spiteful during a time where we lacked the maturity to handle any conflict without hurt feelings. In medical school, I was no longer near the top, but I still had a drive to do well. There was a group of girls in my class who would transcribe lecture notes. These ladies were not eager to share any of their data, even if there was good reason for missing class. I understood their reasoning to an extent, but the refusals were mean-spirited, there was no ‘we.’ In these moments I learned to fend for myself and not rely on a ‘girl code’ or ‘sisterhood’ that would have been a welcome reprieve from the daily grind. I learned initiative, but I also felt like I had to rely solely on myself to succeed. I didn’t feel there were many I could trust. In residency the trend of competition continued. I went into pediatrics, which seems like it would be good because of the larger percentage of women that make up our specialty. In actuality, I felt as though none of us had ever learned to fully support one another, so I didn’t reap any benefit. I distinctly remember feeling proud to have gotten interviews for fellowship, but it meant I had to take some time from my PICU rotation in order to travel. It was my female colleague on that rotation that whispered behind my back, judging my decision to step away during a particularly challenging rotation, and complaining to all who would listen. I wondered, why do we do this to one another? During my second year, I mis-scheduled one of my only week-long vacations to see my family. I did everything I could to still go. I pulled favors from many of my colleagues so all my shifts and clinics got miraculously covered. It was a female chief resident who made the decision that I wasn’t allowed to make the swap, and I couldn’t go. I was hurt and devastated during a particularly taxing time in my life emotionally, and both instances taught me not to trust my female colleagues. 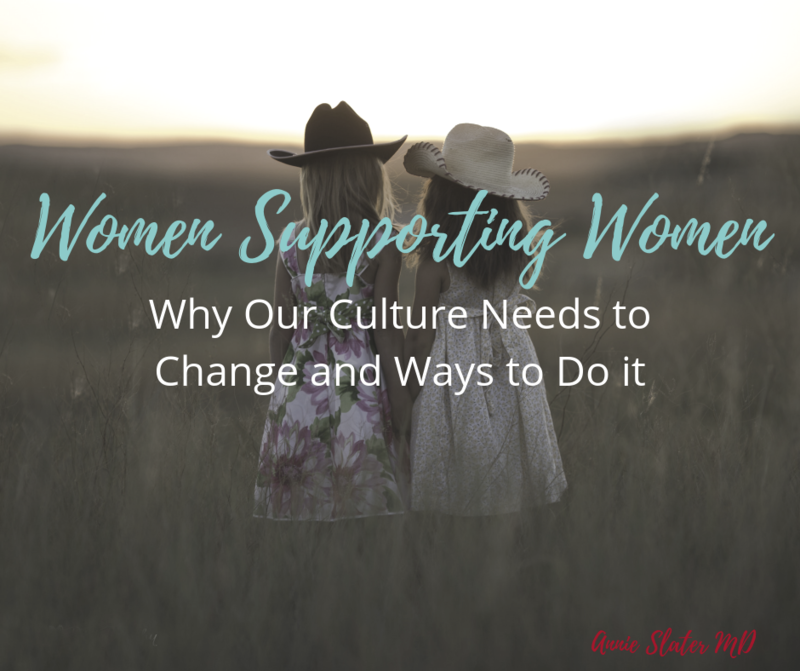 As an attending I have become more fully able to understand how ingrained in my psyche this mistrust and competition is, but I have matured enough to realize that it is also harming me and the women I work with. I’ve been actively trying to change this mindset. It isn’t serving me, and it definitely isn’t serving any woman who comes behind me, or any woman I currently work with. I have also been contemplating, how do we change our thinking? How do we change something we have learned to do for so long? Also, how can we turn the tables on this and make each woman our ally? 1. Recognize we are doing it. Implicit bias is everywhere. When I feel anger or frustration toward any woman at work I try to ask myself what about this person is invoking these feelings? Am I being challenged? Is someone not listening to me? I think I tend to get upset if I am questioned about something and then not listened to. I have learned to ask myself, how can I reframe the narrative? How can I see this person with more compassion, so I am not feeling as though they are judging me. 2. Acknowledge the threatening feeling and talk yourself down. Usually for me, I feel twinges of envy. Or a feeling of being ‘not good enough.’ Then I realize, ‘I don’t actually want what that person has.’ Or, ‘they are trying their best, just like me.’ Seeing myself in them, and recognizing that we all struggle helps to keep me grounded in reality. It also helps to quiet the jealousy that may erupt. 3. Make friends. Lots of female friends. I have found that the biggest antidote to my feelings of inadequacy and rivalry are to make my colleagues my friends, my advocates, my support system. When I arrived at my current job, I felt little to no cohesion among the female faculty. It was lonely and awkward to try to make friends and I struggled with fitting in, feeling like an imposter, and trying to be good at my job. As I have grown in my position and transitioned from a junior faculty to a senior faculty member, I have also brought with me a need to create a space where my junior female colleagues can feel supported. I created a ‘dinner club’ which started with a few women and has slowly increased in size as we have grown as a division. I want to model a behavior that will only result in all of the women feeling more connected to one another. I believe this connection is vital to all of our success. 4. Withhold judgement. I know, I talk about judgment a lot. Partially because it is an active issue for me, as I try very hard on a daily basis to withhold judgment in any given situation. I also realize that most challenges, difficult situations and interactions (especially with other females) result from the fear or presumption of being judged. The instant we allow ourselves to feel judged is the minute we also allow ourselves to see another person as ‘other.’ We then separate from the potential community we could be developing. Everyone is trying their best, and most people probably don’t judge you as harshly as you think they do. We women deserve to be in big happy female groups of friends that support, champion, encourage and love one another. I know how good it feels when I have a friend I can call about my frustration with work, my kid, my husband. Female friends are essential. I think we could all be more successful if we had a group of women we could rely on to ‘have our back.’ I also think these relationships are essential to find more satisfaction in our jobs. Society will be also be improved on so many levels when we as women start making it a point to see the humanity in each of us, to try to have compassion for our fellow women. To see ourselves in the assault victims, to imagine what it would be like to have a child taken away for months on end after reaching the border, or to think about what it would be like if we didn’t have healthcare for our family. Women have the capacity to change the world, and it starts with us supporting one another. Another insightful reflection…may your tribe increase!